A multi-use brushing machine for all your ventilation cleaning needs, CombiCleaner 40 has a 40-meter cleaning axis, chemical nozzle for spray cleaning, a wheel mounted for mobility and a hand control for operating brush rotation. It is designed to clean 75 meters of duct in both directions from one access hatch. Chemical nozzles can be attached, which enable direct spray application of cleaning, disinfecting and duct-coating substances. The CombiCleaner 40 requires a compressor for pressured air, with an efficiency of 10-7 bar and an air volume of 300-600 l/m. CombiCleaner 40 is a pneumatic brushing machine for cleaning ventilation ducts, with a rotation speed of approximately 760 rpm. CombiCleaner 40 is designed to clean large ducts from 200-1200 mm. The brushing device has an extremely extensive reach. The axle length is 40 m, enabling it to clean up to 75 m of duct when extended in either direction from one hatch. Another feature of the CombiCleaner 40 is the ability to change the direction of the rotation. Changing the direction of rotation enables the user to navigate the brush through bends in ducts. The brush can be up to 1200 mm in diameter, as it is kept in place thanks to an ingenious pneumatic brush centralizer. The Lifa Central Control PNEU 40 pneumatic brush centralizer is operated via a control valve. A range of different-sized rods is available for the brush centralizer. A video camera option is available for the CombiCleaner 40. When the cleaning machine is equipped with a video camera, the user can inspect the efficiency and result of cleaning, view obstructions and check the automated steering devices via a TV monitor, during actual cleaning. The diversity of the CombiCleaner 40 is further increased by chemical nozzles, which enable direct spray application of cleaning, disinfecting or duct-coating substances that are carried through the duct along with the cleaning rod. The CombiCleaner 40 can be used for solvent cleaning and disinfecting microbe-polluted ducts. A low-pressure spray accessory, attached to the brushing machine with a bayonet socket, is required for solvents. The CombiCleaner 40 requires a compressor, for pressured air, with an efficiency of 10-7 bar and an air volume of 300-600 l/m. A low-duty, monophase current compressor can be used when cleaning ducts measuring under 700 mm. Larger ducts must be cleaned using the effective, three-phase current Lifa Hydrovane rotary compressor. All Lifa Air brushing machines can clean round ducts or rectangular ducts. The correct choice of brush and cleaning technique ensure that rectangular ducts can also be cleaned. 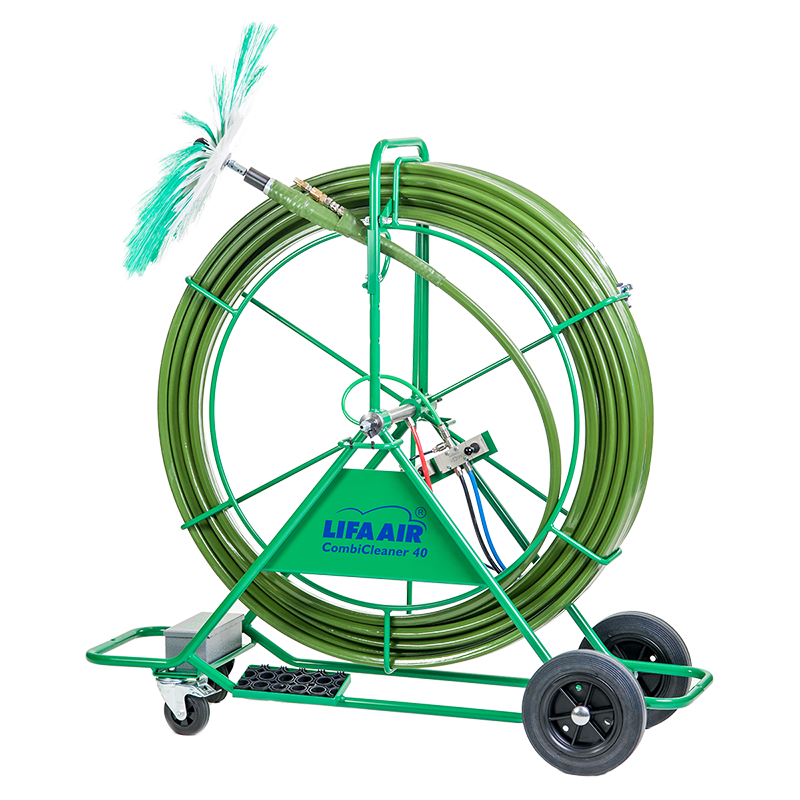 Connecting Lifa’s low pressure cleaning machines AirClean 8000 or HepaClean4000 to the duct ensures the complete removal of all dirt brushed loose in the ventilation duct. Frame and reel: Zinc electroplated steel tube.